Our Guest Blog today comes from John Terra. John has been a freelance writer since 1985 and enjoys writing about everything from running 5K's to reputation.com reviews. Have you ever heard of a VoIP? The word sounds like some sort of sound effect, like "Plop! ", or "Splat! ", doesn't it? But in reality, VoIP is a means for a small to medium business to function more effectively in the 21st century and thereby remain competitive. Intrigued? Read on. VoIP stands for Voice over Internet Protocol. Put in very simple terms, it's telephone communications delivered over the Internet. You may know it by an alternate name, such as broadband phone service, IP telephony, or voice over broadband. Businesses turn to VoIP solutions for unified communication, pulling phone calls, faxes, e-mail, voicemail, and Web and video conferences into one neat, convenient bundle. What follows are some reasons why VoIP can really benefit your small to medium business. Anything that makes work easier and more efficient is welcome in the workplace. VoIP technology uses systems and conventions that most employees are already familiar with. After all, with all of the mobile devices out there, with people texting, web surfing, and placing calls, who would have trouble with a communication package that is built along the same principles? No more trying to figure out a traditional phone system's particular idiosyncrasies and procedures. Hang Up On Phone Switches! In the past, if your small to medium business had a traditional telecom system, there inevitably was a closet filled with phone lines and supporting hardware that kept your system up and running. 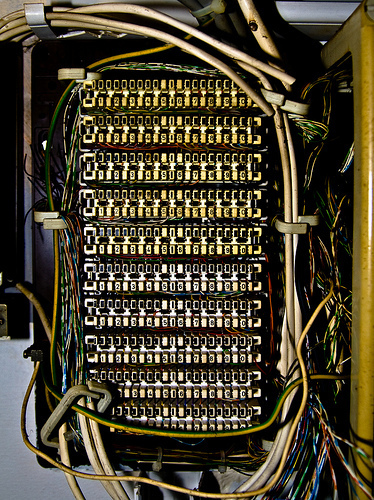 Naturally, all of those lines and switches required a dedicated tech support professional to keep everything going, and to handle any breakdowns and glitches. Well, say good-bye to that when you go VoIP, because the network that VoIP uses fulfills the role of the switches. No more space needed for a bunch of appliances and lines, no more expense of an on-call support professional, and no more costly outages and down time. You get some room freed up, and don't need to worry about making room on your payroll for someone to keep the thing going. When you go to a VoIP system, you gain the services of knowledgeable people who are up on the latest technology, or at the very least can direct you to someone who can help. VoIP businesses were birthed in the Internet age, so they are aware of the problems and pitfalls that can present themselves, and work swiftly on a solution for you and your small to medium business. That's more than you can get from a traditional phone company, whose practices and business models are so 20th century. A VoIP system ties voice and data communication into one network, thereby eliminating the need for a dedicated network for each. Not only does this result in lower costs, it means you can make calls from your laptop, or forward calls to your smart phone. Having everything in one integrated system means greater flexibility, data sharing, and communications, which will save your employees time and energy, and make collaboration and co-operation easier.